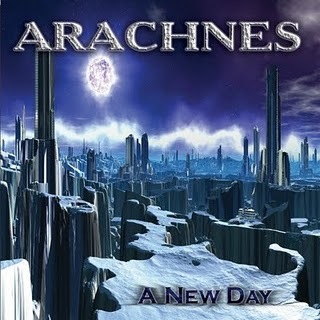 ARACHNES are part of Lion Music´s new digital venture. The band hails from Italy and is based around vocalist Enzo Caruso and his guitar playing brother Frank (STRINGS 24). They list influences from a wide scope, denoting DEEP PUROPLE and QUEEN via YES, ELP, as well as MILES DAVIS and classical music. Eleven new songs plus a cover of DEEP PURPLE`S “Fireball” are on offer. Opener “I Know the Darkness” is a fine example of YES inspired Italian power metal. The slight prog touch blends well with Frank´s guitar work and a nice enough refrain, a highlight. The first half of the album is the most interesting, and they really excel. YNGWIE MALMSTEEN is probably the number one influence, though not cited, but still a vibrant part. Frank is as impressive here as in STRINGS 24, and is largely responsible for the success of songs like “I´m Sorry” and “Magic World”. The feeling of a hastily composed album creeps up as the four last tracks are quite inferior to the fine start. They sound like just about everybody else in an Italian prog/power metal band, and the “Fireball cover” is a faithful enough reproduction with few traces of the elegance, magic touch and enigma that made the first six songs stand out. With more time to prepare, I Believe, as well as to preserve the fresh ideas and spark that was present in the first half of this album, ARACHNES are at odds to make an impact.